Last week during GitHub Universe 2018, GitHub announced support for security vulnerability alerts for Java and .NET platforms. It's a significant contribution for the .Net and Java communities on GitHub because it simplifies, clarifies and alerts organizations and project owners about vulnerabilities on dependencies used on their code base. With security vulnerability alerts, organization owners and repository admins receive a notification when any of their projects has a dependency with a known vulnerability. By tracking public vulnerabilities in packages from supported languages on MITRE's Common Vulnerabilities and Exposures (CVE) List, GitHub notifies repo owners and alerts them of the risk. By default, security alerts will be sent to owners and people with admin access in the affected repositories. More importantly, GitHub never publicly discloses identified vulnerabilities for any repository. But knowing of potential vulnerabilities is just the first step. The next step is to address the issue and update the packages. 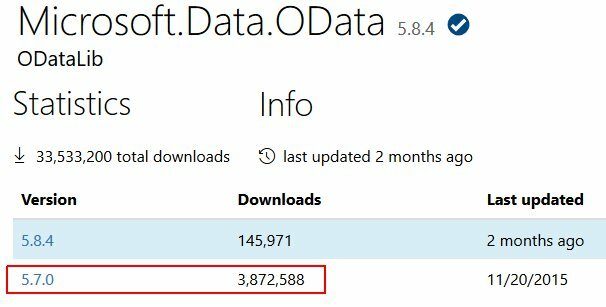 Since .Net users usually update their packages using the Nuget package manager with packages located on Nuget.org, let's look at a concrete example: how to fix a recent vulnerability on Microsoft.Data.OData. So let's update the dependency and patch the vulnerability. Once you've done that, rebuilt and redeployed, you're protected from CVE-2018-8269 at least =) . Bugs security issues are always being found and fixed on libraries that we use. Reason why we should always try to keep our packages up to date. But it's not trivial to scan all packages we use against the CVE database. Note that the CVE above does not state which version it applies to. Imagine how difficult and time-consuming it would be monitoring all the dependency chain ourselves. That's why this service from GitHub is very much appreciated! Let's leverage this very useful feature for our benefit and keep our code secure.